Gakken Medical Shujunsha Co, Ltd. Integration V-CUBE as infrastructure for new Indonesia education project | V-cube, Inc.
V-cube, Inc. (HQ: Meguro-ku, Tokyo, President & CEO : Naoaki Mashita, hereon as V-cube) offers V-cube’s visual communication services as the video communication infrastructure for training of doctors and dentists via e-learning in Indonesia for Gakken Medical Shujunsha Co, Ltd. (HQ: Shinagawa-ku, Tokyo, President: Hiroyuki Kageyama, hereon as Gakken Medical Shujunsha). In Indonesia, doctors and dentists are required to renewal practice permit every 5 years. More than half of the lectures and training required for the renewal can now be accessed through online education. In Gakken Medical Shujunsha, Indonesia South Sulawesi Medical Association, Dental Association, in cooperation with the Hasanuddin University School of Medicine and Dentistry, established a local corporation to perform a lifelong education business for doctors, dentists, addressed to the e-learning business. In Indonesia, to hold the training in order to earn points needed for medical license renewal are concentrated in cities, and travel time and transportation costs have become a burden for local doctors. This online training aims to reduce the burden of doctors. This initiative has been aimed to contribute to the improvement of the country's shortage of doctors and medical environment. As an infrastructure of new online education business in Indonesia, visual communication that can be carried out stably in Indonesia, requires customized development and local language support. V-cube’s services are offered to Gakken Medial Shujunsha and received the following feedback. "V-CUBE" has also been used as a video communication infrastructure of Japan's largest nurses for training support system, "Gakken nursing support." With much flexibility in cooperation and concentration of access to the course management system, we received high praise for the performance and responsiveness in education business of healthcare. V-cube established a local subsidiary in Indonesia in 2013. It has developed a visual communication business for local companies in Indonesian. The service can also be use stable in Indonesia’s unstable line environment. We received the praise to have a great track record in local companies. In Indonesia, the local subsidiary of V-cube, Japanese as well, has many locally hired staff. In addition to the local development for Gakken Medical Shujunsha and V-cube incorporating the accumulated know-how in Japan, we also received high praise for the support in local languages. V-cube, as one of the pillars of the growth strategy of the visual communication in the field of education, is actively working in Japan and abroad. 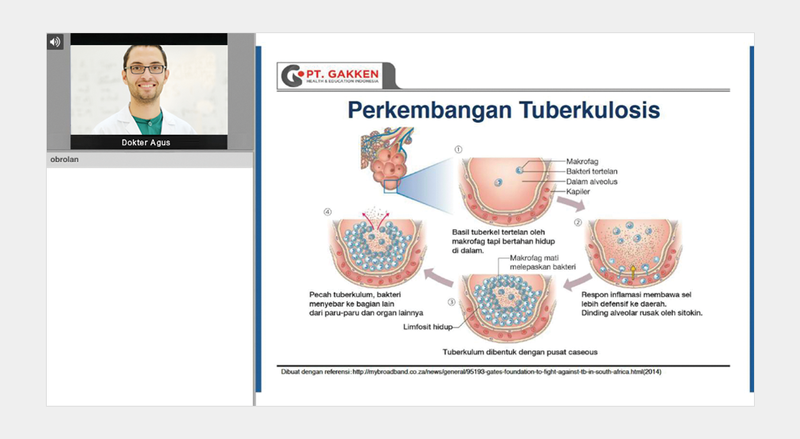 Adoption in the education business in Indonesia of Gakken Medical Shujunsha is, we believe, a good example of the company’s advance in Asia.